Language Arts doesn’t have to be boring! Here’s a fun assignment that helps teens combine literary analysis, academic, and creative writing—because blogs are simply essays in disguise! If Elizabeth Bennet of Jane Austen’s Pride and Prejudice had a blog, what do you think she would write about? Would her posts have titles like “5 Reasons First Impressions Matter” or “How to Turn Down a Marriage Proposal”? What about Mr. Collins? Would he write about winning the hearts of unsuspecting ladies? Maybe Lydia would call her blog The Silly Girl’s Guide to Life. When students begin high school, we tend to throw the idea of creative writing out the window. It’s time to get serious—to write five-paragraph essays and research papers. And students do need to learn these more academic form of writing. But please don’t underestimate the value of creative writing for your older students, too! Essays and research papers require creativity—the ability to hook the audience, put things together in new ways, to see the unexpected, to ask the question “What if?” and explore the world of possibilities. And honestly, it can be fun. Like writing, our approach to reading gets much more serious too. We require them to pick books apart, analyze them (and to write about that too), and figure out the deeper meaning. And once again, those skills do have their place. But I don’t think anyone’s goal through these assignments is to make their students dislike reading and literature—to dread classics because we’ve make it about the work instead of The Work itself. But time is limited. So how can a homeschool mom cover all of these different components of language arts study—the essay, literary analysis, and creativity? The answer is simple: combine them. 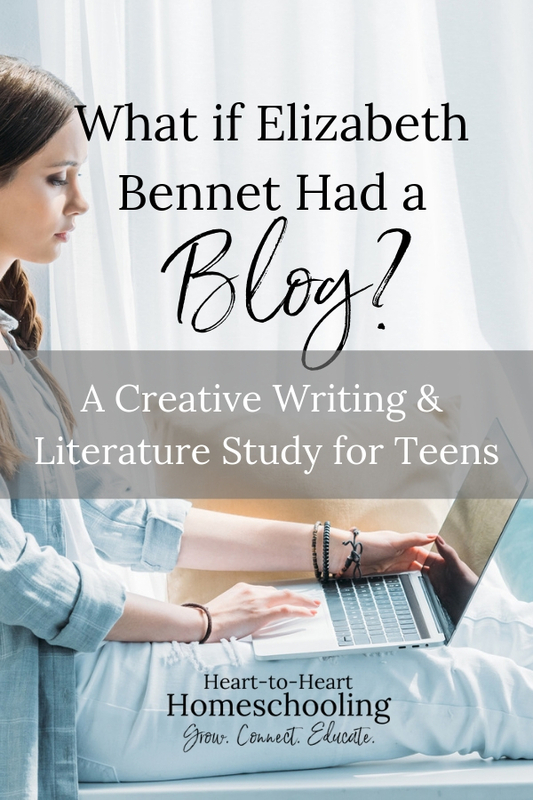 What if Elizabeth Bennet Had a Blog? So we will go back to our original question. What if Elizabeth Bennet had a blog? This modern, personal form of writing is simply an essay in disguise. The structure is similar—introduction, support, and conclusion. Many blog posts present a problem or answer a question, much like the thesis statement of an essay. And good writing skills such as using active voice and varied sentence length apply to both. The formatting may look a little different. Visual organization through headings and subheadings, shorter paragraphs, the use of numbered or bulleted points characterize effective blog posts. But because of this, students will develop the ability to clarify their thoughts and keep their writing focused and organized. Option 1: Write a single blog post. Usually this is best done after reading the entire book. Option 2: Write one at the beginning of the book and one at the end. Option 3:Write multiple posts throughout and see how the the character grows (dynamic character) or doesn’t really change (static character). 2. Choose a character to “write” the blog post. 3. Look over blog posts from a variety of successful authors. I recommend starting with Brave Writer, Living Well Spending Less, and Your Blogging Mentor to see how the pros write effective posts. 4. Write your character’s post according to the following format. Be sure to base it on what you learn about the character in the book—include details and events from the book in the post. This is the first chance to grab the reader’s attention. Effective blog post titles promise to solve a problem or give advice. You’re teen can find hundreds of ideas on Pinterest or by googling “Blog Post Titles”. Today more than ever, if you don’t get your reader hooked from the beginning, you will loose them. Just one click, and your writing disappears. So, the first paragraph (especially the first few sentences) have to compel the reader to continue. 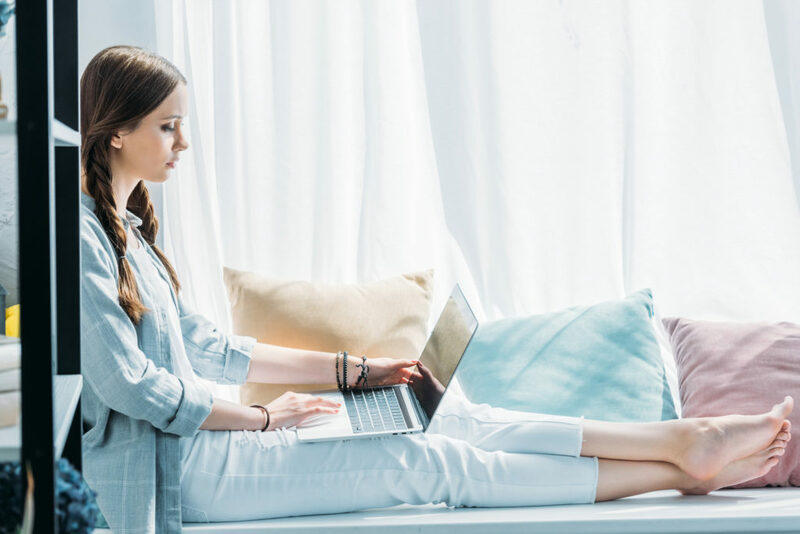 Much like the thesis statement of an essay, good blog posts include a statement letting the reader know what they will learn about—whether it is how to do something or how to solve a particular problem. Think of the solution as the supporting paragraphs of an essay. Using stories, facts, and details, bloggers try to convince readers they have the answer. Include headings and subheadings. Numbered lists and bullet points help readers find the information they are looking for quickly. Because people tend to skim more when reading online, you have to make the information easy to find. Like the essay, you shouldn’t just stop writing abruptly with your last point. The conclusion summarizes or makes a “call to action”. It is often tied back in to the introduction in some way. Learning about literary devices doesn’t have to be boring. We can enjoy both the story and appreciate the actual craft of writing. One way to do that is to approach it creatively. And yes, students need to learn the academic forms of writing.But the skills learned in the process should be applicable to more modern forms of writing too. Help your students continue to exercise their creative muscles and they will improve in every kind of writing, creating engaging and enjoyable pieces that reader’s want to read. Learning, and reading, and writing can truly be both deepand funat the same time. « Dear Mom, Are You Tired? I don’t have high schoolers yet, but I think that this is a fabulous idea! I confess though, I was really hoping to read Elizabeth Bennet’s blog when I clicked over! I’m chucking over Lydia’s Silly Girls’ Guide to Life LOL! Ha! Now that would be a fun new blog series.